The Brewers will be an active team during the the closing weeks of July as the Non-waiver Trade Deadline looms. We know it's coming. Doug said it's happening. Mark A. hinted it. Major changes are coming. They will be freeing salary cap while reloading the farm system in the process. Rebuilding for success is about to begin. I had a long conversation regarding these possible trade ideas with fellow Brewers blogger Ryan Topp (@RyanTopp), who writes over at the Disciples of Uecker blog. We collaborated for a few hours on who are high priority people that need to move, and less important players that don't necessarily need to be moved, but should be shopped. Here are a few trades that make a lot of sense for both parties involved. These aren't rumors, so don't take them as rumors. These are just ideas of mine that I have put together through research of the prospects and team needs. So, let's get started. 1. Milwaukee Brewers trade 3B Aramis Ramirez to the Boston Red Sox for LHP Brian Johnson and 2B Mookie Betts. This one is easy. Aramis is set to be the highest paid Brewer next year at 16 million dollars. That is a lot of money that could be freed up for a rebuilding team. Also, the Red Sox need a lot of help at the hot corner. It's been a cold corner for them, actually. Will Middlebrooks has been terrible this year. The phenomenon that is José Iglesias will eventually cool off as well, although he is playing about as good as anyone right now in the Bigs. When it's all said and done, the Red Sox will need a right handed power bat in that lineup. Ramirez could play some DH for the Red Sox if Big Papi were to play first base on those days. The Red Sox have been a nice surprise this year, and Ramirez could be a nice threat added to that already solid lineup. As for who the Brewers could get, I like the upside in Brian Johnson. He's a south paw who has a 4-pitch arsenal. He has a good sinking fast ball that touches around 92-93, a great slider that is his out pitch, a developing change up, and a decent curve. He's having a bit of an off year at age 22, so he could be available. Brian is ranked the #13 prospect in the Red Sox organization, according to MLB.com. Mookie Betts is a hidden gem in the Red Sox farm system. The other component to this trade is someone hidden in the Red Sox farm system, but someone who I think has a bright future in the MLB. Second baseman Mookie Betts is showing great patience in A-ball. He's actually having a very unique season. He's one of only five players currently in the minors who has at least 7 home runs with more walks than strikeouts. Betts actually has almost twice as many walks as strike outs with at least 7 round trippers. (8 HR, 46 walks, 29 strikeouts). To put that into perspective, since 2001, only Barry Bonds has accomplished such a statistic. I believe the Red Sox would love to have Aramis Ramirez. If they bring him back for next year, it would give the Red Sox another year to develop 3B Garin Cecchini so he's ready by 2015 to take over the hot corner in Boston. 2. Milwaukee Brewers trade RHP Yovani Gallardo and 1B/OF Corey Hart to the Texas Rangers for 3B Mike Olt, RHP Neil Ramirez, and RHP C.J. Edwards. This might seem as a stretch for some, as Texas rarely trades away top prospects. But, there's a part of me that believes Texas has a secret man crush on these two Brewers. A lot of this trade may be apart of a desperation move by Texas if suspensions are handed out to Nelson Cruz for being a part of the Biogenesis scandal. The Rangers are having all sorts of starting pitching issues to people not named Yu Darvish. Injury after injury after injury has caused over half the rotation to land on the DL. Gallardo has been proven to be a rather healthy guy since his ACL tear and recovery, which is appealing to any team looking for a reliable pitcher. Another thing worth noting is that a trade very similar to this almost happened between the Brewers and Rangers last season when the Brewers were shopping Zack Greinke. Much like I mentioned above, the Rangers were reluctant to want to move any big prospects. However, now the Rangers have talked about moving guys like third base prospect Mike Olt, who would have to be the big name to come from Texas to the Brewers if they were to send Gallardo. Neil Ramirez and C.J. Edwards are two pitching prospects the Brewers would likely be interested in. Much like the Zack Greinke trade, the Brewers will focus on getting a top prospect and then get two potentially great players as well. However, this time the Brewers will have to send more than one player, and it could be Corey Hart if he can prove he can play after the All-Star break. Texas would love the power bat of Corey Hart especially if worse comes to worst for Nelson Cruz. But the likelihood of any team wanting Hart is slim. So maybe you look to move Nori Aoki? Just to shop him, as he is one of the guys you wouldn't mind having in future plans but definite depth is there in the minors in case you do move him. Furthermore, Logan Schafer is sure proving he can be an every day player, thus losing Aoki wouldn't pinch as much. Baltimore makes about the most sense on paper. Baltimore desperately needs pitching, and they have a ton of prospects. Plus, their issues at second base were like the Brewers' issues at shortstop a few years back. They have nothing acceptable now, and nothing in the works in their minor league system, which is why the trade makes a huge amount of sense. Gausman after signing his contract last season. Much like the trade above, this trade would have to produce a top prospect from the Orioles farm system. Kevin Gausman is the obvious choice. 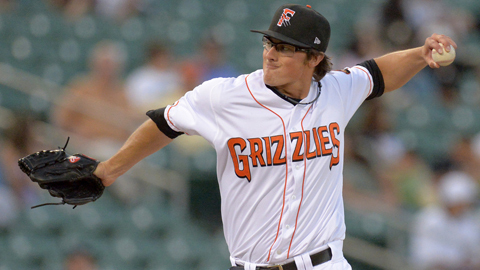 Taken 4th overall in the 2012 MLB Draft, Gausman is quickly climbing the levels of the Orioles farm system. Currently pitching in Triple-A along side with Dylan Bundy, he has been rather impressive. Ignoring the wins and losses, Kevin has a 3.11 ERA with 46 strikeouts and only 5 walks. He's got ace potential, number 2 guy at worst. He's going to be a front line starter in the near future. If we are sending Weeks too, then I expect more names to be involved in such a trade like this. Christian Walker would be a great get for the Brewers in case the Hunter Morris project doesn't work out. Walker hits for average (currently batting .317 in the minors). He has 81 hits with 21 of them going for extra bases (14 doubles, 7 home runs). Currently plays in High-A ball and projected to make MLB debut somewhere in 2015-2016. Finally, a little bit of a gamble but high ceiling player is Michael Ohlman. He's a catcher. He had a really bad year in 2011. Since then, he's been turning it up and showing vast improvements. Some scouts don't trust it, but you can't ignore the stats. In 2011 he hit .224. Two years later, he's batting .283. Still not "blown away" numbers, but they are definitely noteworthy. All of this comes together with sending away Rickie Weeks. The Orioles have a serious issue in their farm system with a lack of developing a second baseman. Weeks would bide them a few years time to address that issue. As much as don't want to see Weeks go, his salary bumps up to 11 million dollars next year and that may weigh the Brewers down if they truly focus on rebuilding. 3. Milwaukee Brewers trade LHP Michael/Mike Gonzalez and RHP Francisco Rodriguez to the Detroit Tigers for OF Tyler Collins, LHP Matt Hoffman, and RHP Melvin Mercedes. This one is a no-brainer. The Tigers need bullpen help. Bad. Jose Valverde is showing the Tigers why they didn't bring him back in the offseason. They have no real reliable source in the pen to take over the closer duties besides Phil Coke. Bruce Rondon was a big tug of war as far as will he be or won't he be our closer. Bottom-line, the Tigers need bullpen arms. The Brewers could send a proven closer in K-Rod and a decent situational pitcher in Gonzalez in exchange for a few prospects. Both are veterans which is something that (kind of) young bullpen staff needs. The most important thing to remember is that this is what the Tigers need right now. They may be willing to part ways with some guys in the lower parts of their minor system to win now, which is why I chose Matt Hoffman and Melvin Mercedes. They both are promising relief pitchers that are just tearing up the minor leagues right now. Hoffman is 24 years old left handed pitcher in Triple-A for the Tigers. Hoffman is not on the Tigers 40 man roster, which is odd. He currently has an ERA of 1.13. Melvin Mercedes might be a bit tough to get from Detroit. He's on their 40 man and he's having a better season than Hoffman. Granted the right handed pitcher is only 22 years of age pitching in High-A, his numbers are still really good. As a closer, Mercedes is sporting a line of 0.66 ERA/0.91 WHIP/.202 AVG, 11 saves, and 17 strikeouts in 27.1 innings pitched. Finally, Tyler Collins is a corner outfielder with some good pop in his bat. Though only batting .223 so far this year, he is still putting up pretty decent stats. 22 extra base hits on 45 total hits, including 9 home runs. 4. Milwaukee Brewers trade RHP Kyle Lohse to the San Francisco Giants for LHP Michael Kickham and LHP Ty Blach. The Giants will be looking for a helluva lot more than just starting pitching come the trade deadline. They need help all around the baseball diamond. The starting rotation, bullpen, second base, and outfield all need to be addressed for them. I think the Brewers will help them with a starting pitcher as Kyle Lohse makes a lot of sense here. They have some payroll freeing up after this season as the Barry Zito contract is on it's tail end. So picking up Lohse's contract wouldn't be all that bad for them. Kickham pitching for the Giants' Triple-A affiliate. Unlike the teams listed above, the Giants farm system isn't anything to write home about. There are a few guys that stand out that I think would have to be a part of the deal. The first being Michael Kickman. He's a lefty. He's got a good strike out pitch. And, he's likely only a year or so away from being 100% Big League ready. He made one start for the Giants this year and showed he isn't exactly ready yet. He only lasted 2 1/3 innings and is sporting a 15.43 ERA. He'll be a great middle of the rotation guy once he's truly ready. Ty Blach is an interesting one. He's not anywhere near Baseball America's Top 30 (per team) for the Giants. Yet, he's tossing really good numbers so far this year for High-A. He's 7-2 over 12 starts, 2.41 ERA/1.09 WHIP/.255 AVG, while striking out 63 batters and only surrendering 8 walks. I like his upside and can be a good middle of the order lefty arm. I'm not saying every single trade idea will happen, but these are some options the Brewers will have. They will be heavily shopping players for the next month and a half. It's going to be a pretty wild time. Change can be hard to deal with, especially as a fan because of the connection you develop with your favorite players. But, a change of landscape is needed for this team and it should be something everyone should be looking forward to if they want to Brewers to succeed in the near future. Are you f'ing insane? The Rangers arent going to trade Mike Olt for Gallardo and a guy who hasnt played in one game this year. And the Orioles arent goign to trade one of the best pitching prospects in baseball for a declining Gallardo and a dramatically declining Weeks. Anonymous is right. You are a complete clown concocting these deals. They have absolutely zero chance of happening. Nice work though. Thank you both for taking the time to read the article and giving your feedback. What many fans don't know or value is the "win now" mentality teams have when it comes to the trade deadline. Also, people undervalue team control. Getting a #2 pitcher like Gallardo or Lohse with two more years is huge, especially at the low payroll hit. Looking at the history of how the trade deadline works, the players I listed fit right in with how it's been done before. Some have actually given me feedback saying I've undersold what Milwaukee could get in return. To each their own and I respect your opinions, but these are (as stated above): ideas. Gallardo is not a #2 pitcher for a playoff team (not that the Giants are a playoff team). Then what was he in 2011 for the Brewers? Oh, he was a number 2 on a playoff team. Gallardo has had an ERA of 6.39 since your reply. Stop living in the past. I'm sure you also know the Brewers are the worst in baseball this year when it comes to fielding ground balls and this year Yo has a career high ground ball rate at 49.9%, and a 1.87 GB/FB ratio. His HR% is at 2.3%, the lowest it's been since 2010 (1.5%). Not saying he's having a great year, but defensive stats show it's not all on him. I would be ecstatic about the Oriels deal, but something tells me this is the least likely of the scenarios. One can dream. I think a deal with the Giants for some pretty sure thing, middle of the rotation guys more likely. Yovanni's stats after the break will go a long way in determining this of course. I hate thinking about parting with Yo but the team really does need to start thinking down the road a bit.